Firstly, welcome to our newest career blog. In this post, we will focus on how to become a mobile app developer. How to become a mobile app developer. What does a mobile app developer do? Our daily lives are dominated by mobile apps. You use them to check your mail, connect with your friends and colleagues, play and gather music, store information, the list goes on. Looking at the Most Used Apps in the World in 2018 blog, I am sure you are familiar with most of these. A mobile app developer refers to anyone that can design, build/or maintain a mobile app. The two most coveted platforms for these would be IOS and Android, but there are various others. These include Mobile Windows, Blackberry, Symbian, SAP, Kony etc. A mobile app developer would, therefore, most likely be someone (usually with software development background) who builds and/or maintains an app. Often entrepreneurs or businesses come up with ideas as to what they need and approach mobile app development companies to execute this. This is naturally where the mobile app developer come in. Another alternative would be for someone to come up with their own mobile app idea, build, maintain and market it themselves. This is where the entrepreneurial spirit is essential and would involve a lot of other skills not necessarily related to a mobile app developer. So what does a day in the life of a mobile app developer look like? A mobile app developer would spend most of their day behind their computer. The ‘office environment’ will, however, have a great impact on exactly how they would be spending their days. There is no better way for a developer to build skills and knowledge than by doing app development. Also, specialised training and boot camps are highly recommended to get up and running in this field. There are a few ways to go about it. Each probably focused on a different outcome. To become a mobile app developer you would need skills and knowledge in software development. A bachelor’s degree in computer science, software engineering, management information systems or similar fields would be very beneficial. Most universities would have options within the field of software development and engineering. With a degree, it would be easier to approach a company and work as a web app developer to gain access to the industry that way. Coding bootcamps can be great in kickstarting your career as a developer. These popped up in the past 10 years. They mainly originated because of the high demand for coders and insufficient supply. These can last anything from a weekend to a few months, depending on the content and the program. At these camps, you are submitted to an intense hands-on program, teaching basic coding skills. These coding skills are however usually only in a specific field of coding while a computer science degree will give you a wider focus. For this reason, some employers will prefer to hire from certain bootcamps, while others would prefer hiring someone with a computer science degree. However, coding bootcamps can be very pricey and you have to make sure you pick the field of coding most in demand. You can go at this on your own with no qualifications, but you will definitely to make sure you are prepared for hard work. If you are more of a do-it-yourself, go-getter, you can learn the skills to become a mobile app developer on your own. You can learn to code and buy the necessary tools. If you want to develop on Apple platforms, there are free tools and resources available for beginners. For only $99 per year, you can register as a developer and download the programming tools. The Android software development kit is free to download. Guides to the different Android app kits can be found on the Google Android development site. You will, however, need to learn the programming language, Java. You can also access the coursework for CS50’s Mobile App Development with React Native from Harvard University and other very useful resources from the Massive Open Online Courses link below. Unfortunately, app stores are overflowing with apps of all shapes and sizes. Unlike 10 years ago, if you want to develop a successful app you will have to produce a well-designed one and make sure to hone your marketing skills. Salary expectations for mobile app developers can vary greatly. Glassdoor reports salaries starting at £24 000 pa for entry level, all the way up to £8 000 monthly (£96 000 pa) for a developer with 8-10 years’ experience. Glassdoor is of the opinion that the average base salary for a mobile developer is £30 200, calculated from 34 salaries as of 3 January 2019. Much higher salaries than these are reported, with IOS developers earning slightly more than Android developers in general. 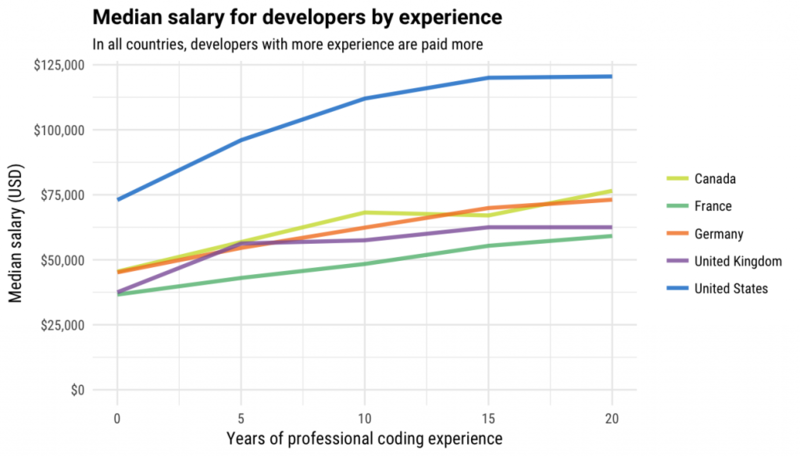 Developers in the United States and Australia seem to earn the most as shown in the below graph. In these countries, app developer income is more than $100 per hour.